DroidDosh.com - Android 7.0 Nougat is a really big update for the Galaxy J7 (2016) because it brings a whole new experience and features along with the Samsung Experience UX 8.1. Why do we need to update the firmware? Because by updating the firmware we will get the latest security updates and also new features that previously did not exist. If you have not yet received the Nougat OTA update notification on your Samsung Galaxy J7 SM-J710F, you can check the availability of the update by going to Settings > About device > Software update and tapping the “Download updates manually” option. Alternatively, you can download the official Android 7.0 Nougat firmware from the link below and install it using Odin. And now on this article I will share the trick about how to update Galaxy J7 (2016) SM-J710F (XSG) from United Arab Emirates to the Android 7.0 Nougat firmware. Installing Samsung firmware using Odin software is not the official way to do it. This method is used only if you want to unroot or reinstall an official firmware in case you are using a Custom ROM. We won’t be held responsible for anything happening to your device during this process. We will help you during such situation. Please read follow each and every step as mentioned below. Backup your apps and data as a precaution. As the new firmware might wipe/rest your phone. Go to Settings on your phone > scroll down to About device or About phone and tap on it > note the Model number. This guide is focused on Samsung Galaxy J7 (2016) model SM-J710F. 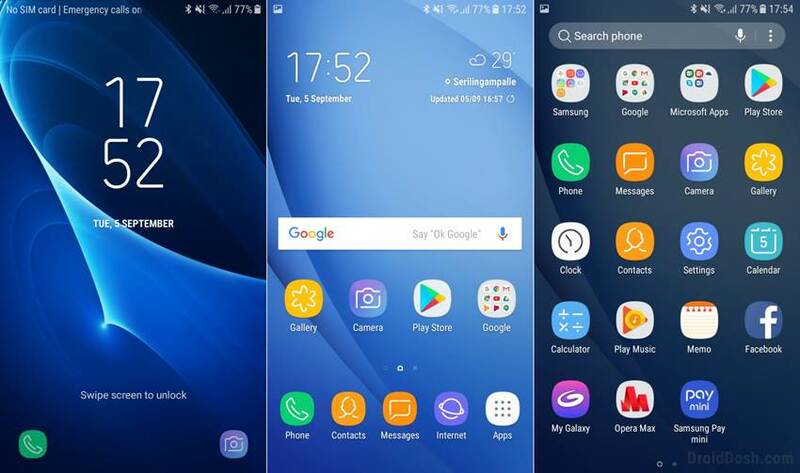 Download and extract the Android Nougat 7.0 Firmware for Samsung Galaxy J7 (2016) SM-J710F at the link below. The latest J710FXXU3BQHE Android Nougat 7.0 firmware is now available for the Galaxy J7 (2016) SM-J710F (XSG). Samsung Kies is not compatible with Odin Samsung. You have to make sure that Kies is not running in your system tray. It is recommended to uninstall Kies before using ODIN. Finally, click the Start button to initiate the installation and wait until the installation completes. When the firmware is installed, you will get PASS! message in Odin and your phone will reboot automatically. You can now disconnect the USB cable. The first boot takes about 5-8 minutes, you need to wait patiently.